Elluel is a new place introduced in the Legends patch. It is near Ellinia. In fact, the place is actually in the Ellinia hunting grounds. This place is a job-advancement town where a character, Mercedes is a Queen of Elves here. To save themselves from the curse of the Black Mage, Mercedes casted a freezing spell that freezes herself and everyone else in the town. When Mercedes wakes up, she becomes Level 10 again and she starts training again. The place here is just like Rien and Ereve, except that it is not an island. There is a portal that takes players to other towns in Victoria Island. Mercedes has a skill that can be used to transport herself back into this town. 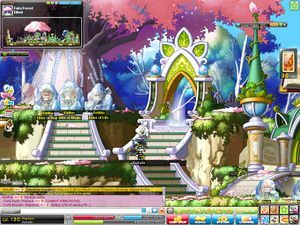 Fairy Forest : Elluel Plays music. Fairy Forest : Elluel Potion Merchant. Fairy Forest : Elluel Sells weapon and armor. Fairy Forest : Elluel Storage. Fairy Forest : Elluel Transports you to other towns in Victoria. Fairy Forest : King's Seat Warps you to Advent of the Great Spirit. Fairy Forest : Advent of the Great Spirit 2nd job advancement for Mercedes. This page was last edited on 18 July 2016, at 22:41. This page has been accessed 16,956 times.